If you want to allow other people to email you from your profile, go to your profile, click “Edit Profile”, then click on the “Send an email” icon (below your profile picture) to edit the settings. By default your profile does not have the “Send an email” option active. 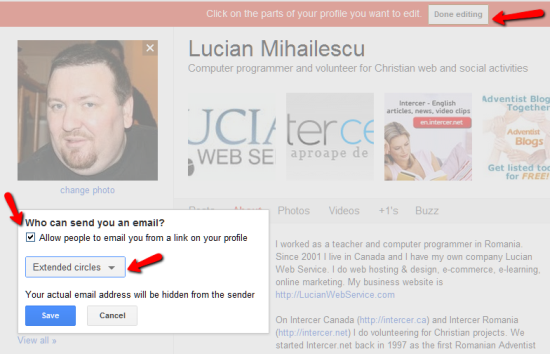 To activate this setting, you can check the box that says: “Allow people to email you from a link on your profile”. Then, below you have five options for “Who can send you an email?” section. Your actual email address will be hidden from the sender. After choosing the settings that you want, click “Save” and then “Done editing” at the top of your profile.